Workers on a road construction project on E.K. Gaylord Boulevard in downtown Oklahoma City. Journal Record editor Ted Streuli speaks with KGOU's Jacob McCleland. Education proponents and other Oklahoma City residents spoke out against a MAPS sales tax and bond proposal at this week’s city council meeting. If approved by council on June 20, the public will vote on the $1.1 billion proposal in September. The general obligation bond package, permanent quarter-cent sales tax and temporary three-quarters cent sales tax would be used for infrastructure improvements and emergency services. The sales taxes would be a continuation of the expiring MAPS 3 one percent sales tax. Rev. Lori Walke and about twelve other residents tried to urge the council to use the MAPS 3 penny for schools. Walke argued good streets would be worthless for the economy if a poorly educated workforce can’t attract new business, according to the Journal Record’s Brian Brus. “You know that the state Legislature failed to keep its promise to increase funding to education,” the Rev. Lori Walke told council members. “We are here this morning because you can fix this. … This council can set an example for the rest of the state. Oklahoma City Public Schools board of education chairwoman Paula Lewis told council members the state legislature has left the school district scrounging for funds. By the end of spring, the district budgeted $2,950 per pupil, less that half the national average, according to Brus. 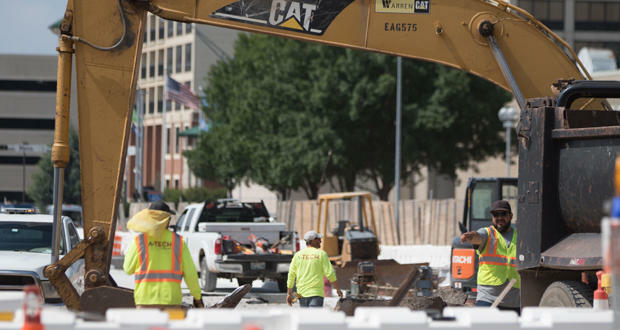 The Greater Oklahoma Chamber chairwoman Rhonda Hooper told council members that her organization supports the package because improving the city’s roads is a high priority for the business community. “Our board of directors met last week in a very lengthy and in-depth discussion about the needs and proposals,” Hooper said. “Trust me, in our conversations with existing businesses, roads are a primary concern. If you’re having to zigzag within your lane to avoid damaging your wheels in a pothole, it’s very frustrating. Journal Record editor Ted Streuli says municipal sales tax money can go toward education, but cities have to be careful about how they do it. In the past, both Oklahoma and Tulsa have found ways to devote sales tax to schools. “They just have to be sure it’s used for very specific purposes. In Oklahoma City, for example, the second MAPS tax paid for the construction or renovation of 70 schools, as well as a lot of technology and vehicles. And that frees up money the school district can use elsewhere,” Streuli said during his weekly conversation with KGOU. Streuli says a proposal to create a temporary income tax to fund education was met with resistance. “Cities really aren’t supposed to fund schools in Oklahoma. Education costs are the responsibility of the state government, so there’s political push-back from city councillors who want to stick to traditional infrastructure and emergency response concerns,” Streuli said. Jacob McCleland: Ted, we talked about the tax and general obligations bond proposals a couple of weeks ago. Before we go any further, could you first kind of give us a quick rundown of what they do? Ted Streuli: Sure. The bond issue is necessary to pay for projects such as street repairs, emergency response systems, drainage, that kind of thing. And a portion of the new tax, sales tax, would be temporary, generating money for capital projects, but the other portion would be permanent. It would generate between $30 and $60 million for the city over the first couple years. McCleland: So these proposals would go toward infrastructure repairs. But this week, reporter Brian Brus wrote about why it’s gathering some opposition from educators, for instance. What are they arguing against? Streuli: They just don’t see filling potholes as their top priority. They say schools are really in trouble and education should go to the top of the list. McCleland: Why are these education proponents looking to MAPS money as a possible revenue source for schools? Streuli: Well, they’re saying that fixing streets isn’t going to help business if our school system scares people away from moving here. They say the legislature broke its promise to give more to schools this year, so they’re looking for any kind of help they can find financially. Oklahoma City’s per-pupil spending is less than half the national average, so they’ll take any money they can get. McCleland: But under the way schools are funded in Oklahoma, is it even possible for this type of sales tax or bond proposal could fund schools? Streuli: It is if they’re careful. Oklahoma City and Tulsa have both found ways to put sales tax money into schools, they just have to be sure it’s used for very specific purposes. In Oklahoma City, for example, the second MAPS tax paid for the construction or renovation of 70 schools, as well as a lot of technology and vehicles. And that frees up money the school district can use elsewhere. McCleland: So are there any other options on the table for the city to increase funding for education? Streuli: Well, a temporary income tax was proposed, but that was met with a great deal of resistance. Cities really aren’t supposed to fund schools in OKlahoma. Education costs are the responsibility of the state government, so there’s political push-back from city councillors who want to stick to traditional infrastructure and emergency response concerns. McCleland: I want to switch gears and talk about Oklahoma’s film industry for just a minute. The deadCenter Film Festival was held last week. Also, during the last legislative session, lawmakers cut the state’s film industry rebate, but they didn’t completely eliminate it. Journal Record reporter Molly Fleming wrote that some local filmmakers see some drawbacks to making films here. What are the downsides of Oklahoma filmmaking? Streuli: The big one is that there are a lot of post-production services that just aren’t available in Oklahoma, and that slows down production. There aren’t any companies that can do the computer-generated models that a lot of films rely on. There aren’t any Oklahoma-based distribution companies. Those were two of the missing services we heard the most about. McCleland: So what do filmmakers do if they don’t have these services available here in Oklahoma? Streuli: They get it done elsewhere. We talked to filmmakers who had to get parts of their movies done in California or overseas. One filmmaker we interviewed uses a company in Russia. And most of the distributors are either in California or New York. McCleland: So why aren’t their post-production shops or distributors here Oklahoma? Streuli: They told us they’re skeptical about the rebate program, which is always discussed here as something that could be cut and is scheduled to end in 2024. So it’s hard for a company to justify all the startup costs if they think they’re going to be gone in five to six years because the movie-making business will migrate to states that still has incentives.